War, our leaders tell us, is needed to make the world a better place. Well, maybe not so much for the 43 million people who’ve been driven out of their homes and remain in a precarious state as internally displaced persons (24 million), refugees (12 million), and those struggling to return to their homes. 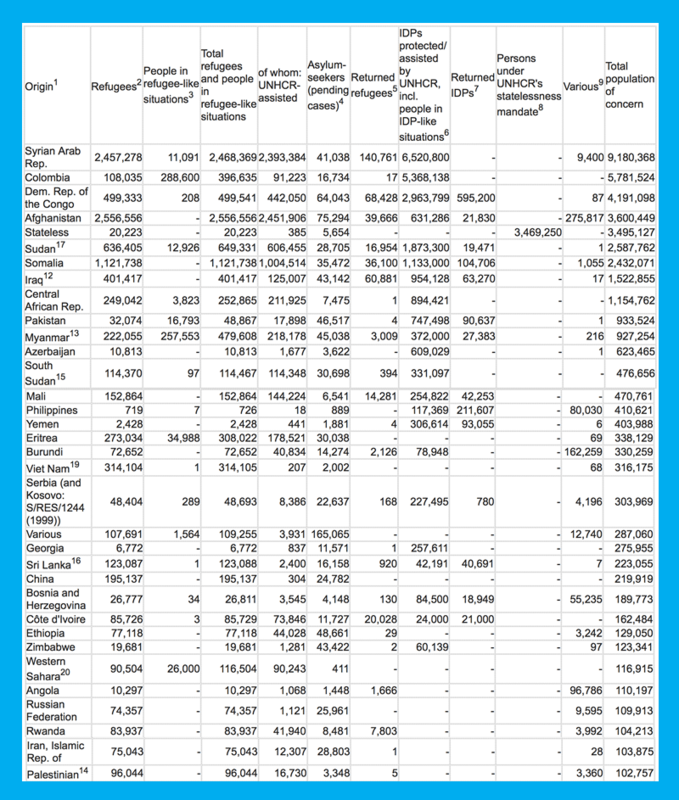 The U.N.’s figures for the end of 2013 (found here) list Syria as the origin of 9 million such exiles. The cost of escalating the war in Syria is often treated as a financial cost or — in rare cases — as a human cost in injury and death. There is also the human cost of ruining homes, neighborhoods, villages, and cities as places in which to live. Just ask Colombia which comes in second place following years of war — a place where peace talks are underway and desperately needed with — among other catastrophes — nearly 6 million people deprived of their homes. The war on drugs is rivaled by the war on Africa, with the Democratic Republic of the Congo coming in third after years of the U.S.-backed deadliest war since World War II, but only because the war on “terror” has slipped. Afghanistan is in fourth place with 3.6 million desperate, suffering, dying, and in many cases understandably angry and resentful at losing a place to live. (Remember that over 90% of Afghans not only didn’t participate in the events of 9-11 involving Saudis flying planes into buildings, but have never even heard of those events.) Post-liberation Iraq is at 1.5 million displaced and refugees. Other nations graced by regular U.S. missile strikes that make the top of the list include Somalia, Pakistan, Yemen — and, of course, with Israeli help: Palestine. Humanitarian wars have a homelessness problem. Part of that problem finds its way to Western borders where the people involved should be greeted with restitution rather than resentment. Honduran children aren’t bringing Ebola-infected Korans. They’re fleeing a U.S.-backed coup and Fort Benning-trained torturers. The “immigration problem” and “immigrants rights” debate should be replaced with a serious discussion of refugee rights, human rights, and the-right-to-peace.